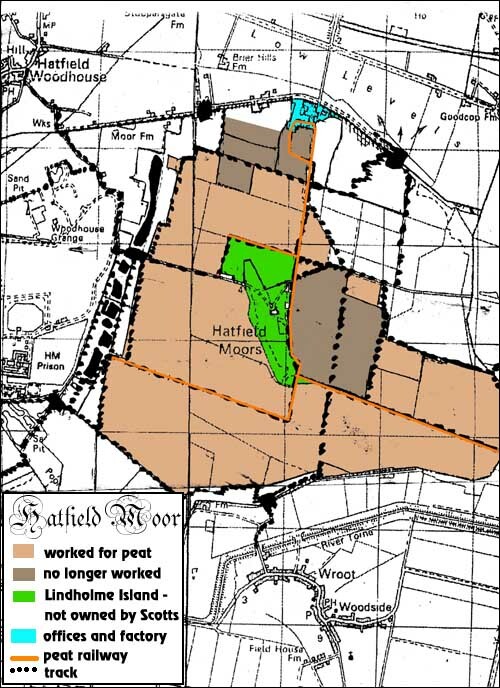 Work digging peat on Hatfield Moor takes place roughly between Easter and the end of September, but the exact dates are dependant on the weather. If you manage to get onto the site then you can probably use your imagination for what it is possible to do. One good action which might not be immediately obvious is to fill in the drainage ditches which criss-cross the site. This makes the land drain less slowly and preserves the hydrological integrity of the site. The land eventually drains to the south-east, with water being removed by two pumping stations, as shown on this drainage map. Another map of the moors is below, showing the extent of the workings. Taking the peat out of the site is a narrow gauge railway track. This railway is a bit rubbish: it's easy to break and if you manage to make the trains speed up then they tend to derail.